Firstly, Happy Easter! Hopefully there will be a proper Easter post later today if things work out. Obviously, I am still a little stuck on Queen at the moment but only because the American Idiots were still mangling the songs. I had the misfortune of turning on the telly and as if pulled into a horrid fascination, watched them perform a medley of Queen songs that was so badly arranged I cannot believe that they had the band's blessings. The only good thing that came from this was Chris Dougherty's (how do you spell his name anyway?) brief rendition of Under Pressure. Why didn't he just sing that the previous night? Anyway, I'd cooked and written this recipe a while ago but just did not have the time to post it. But as the dish is Goan and so was Freddie, I thought it was time. Since I can't sing to save my life, I will pay tribute to the man with a talent and charisma as big as his teeth, in my own way - through food. 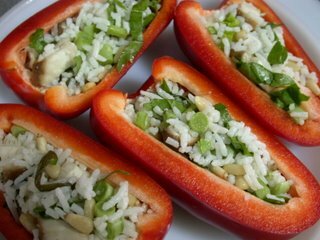 I served this to Graeme when he was in town visiting me, accompanied by my Chicken Rice Pining in Red Peppers, essentially a stuffed red pepper concoction devised from my leftover chicken rice, pine nuts, haricot verts, spinach, and shiitake mushrooms. There was a slight mishap that day as my "oven" refused to work for some reason and I ended up having to cook the peppers in the microwave instead. I don't think they were quite Graeme's favourite but I think he rather enjoyed the Chicken Cafrael - as attested by the rather clean "platter". 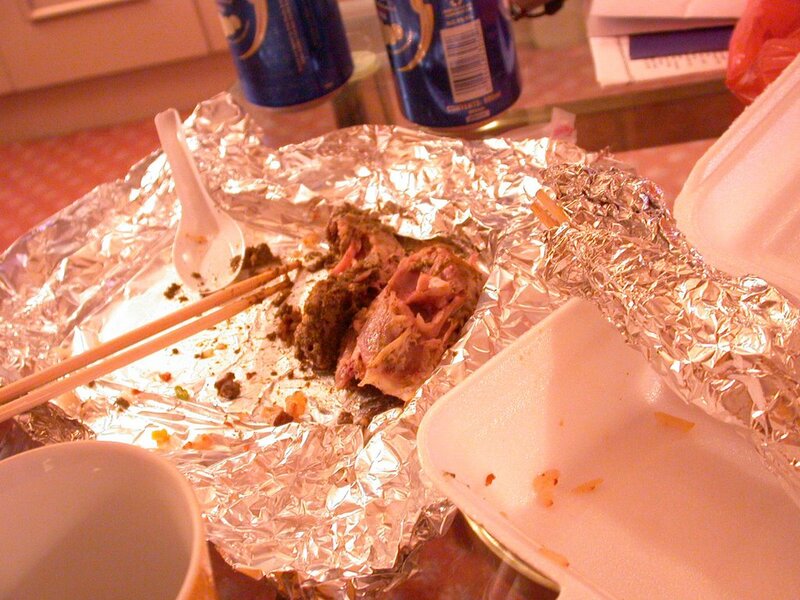 All this was eaten under the cloak of secrecy as we snuck the food into Graeme's hotel suite. 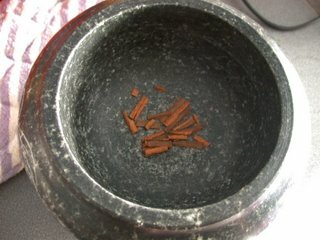 On route to our clandestine homecooked feast, I realised I'd forgotten to bring the cutleries. Luckily I come from resourceful, pioneer women stock. 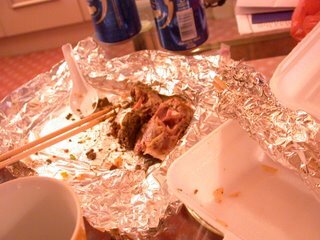 I devised little platters from the aluminum foil I had wrapped around the Glad containers to keep the food warm and we used plastic cutleries from the nearby food court. Very unglam but totally satisfying. Only wished Oscar could have been there to share it. Anyway, I still had leftovers from that feast and last night, I decided to reheat the last remnants of the Chicken Cafreal and chicken rice for a quiet dinner at home. While mentally willing the timer on my microwave to go faster, I heard a loud pop and alarmed, assumed that it was the microwave. 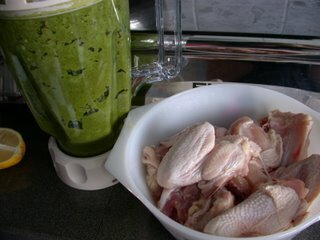 But no ... my chickies were merrily and safely turning around in circles in the amber glow of my trusty microwave. I turned around only to be splattered by a wild spray of chocolate fluid. Eeeuuwww! 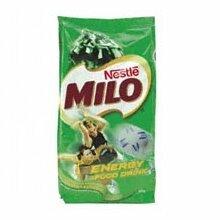 Did you know that packet Milo drinks can explode? No? Neither did I. I am still mystified as to how my never-opened six-pack of Milo drinks managed to explode, spewing the gooey sweet chocolate everywhere. The floor was a Valdez spill of brown sludge. Being the graceful gazelle that I am, I of course, slipped, fell and managed to get it all over my top. It was carnage. I looked like a mud wrestler who lost the battle with herself. Clean-up was absolute hell as the Milo had managed to get into every corner, crevice, nook and surface in the kitchen. I was exhausted by the time I wiped the last bit of brown stain from the floor. Sitting down to my Chicken Cafrael was a welcomed relief. Especially as it still maintained all its flavour even after sitting on the counter while I did major clean-up. How much do I love my Chicken Cafrael? I've made it for years and it is still one of my favourite failsafe dishes. 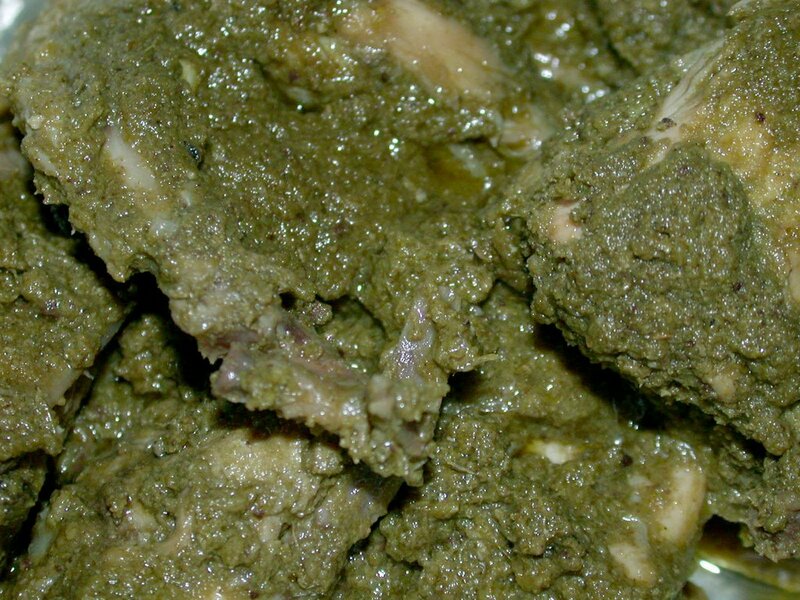 The green paste is smooth and adds a velvety coat to the flavourful chicken. It is spicy (although I toned it down for Graeme since I normally use 10-12 green chillies for myself) and aromatic yet with a hint of tang from the lemon juice. The strongest note is from the coriander but it is not overpowering at all ... just extremely heady and seductive. All the spices blend so easily and harmoniously into a cohesive explosion of flavours that you just lave every drop of the thick sauce. 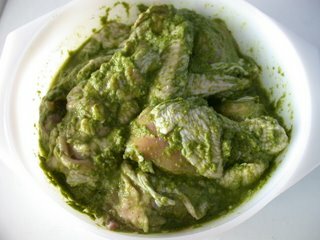 Except for the time needed to marinate the chicken, it is such an easy dish that I can usually dish it out under any circumstance or pressure. Milo explosions included. Chicken Cafrael deserves a 10/10 for flavour and health. It even looks healthy with all that green - if only it photographed well. 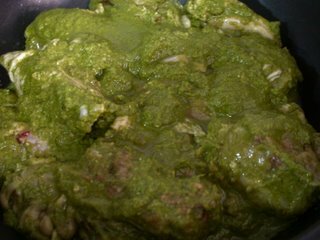 I once had a young cousin look at it dubiously and declare that it look like shite and what was all that green stuff on it? He shut up after the first bite and later told someone I was a great cook and someone should marry me. He's 10 going on 100. After all the drama with food terrorism today, I was ready for an early night so I can go watch The Producers the next morning. I may never be able to look at another Milo beverage the same way again. Question: do you pulverize the roots of the coriander as well? Or just the leaves and tender stems? P.S. 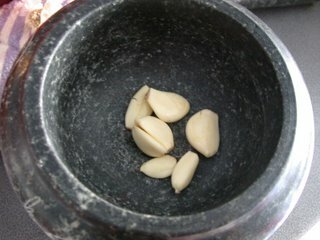 I have mortar and pestle envy. Yours is beautiful! Eliza - No, I do not use the roots for this dish but you could I guess. 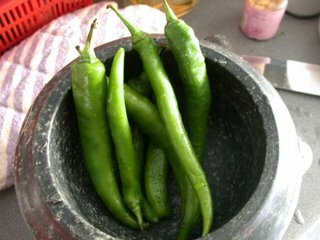 I usualyl save the roots and use them for soups and my Thai/Indochinese type food. 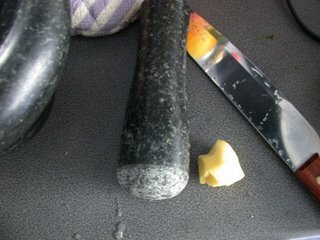 And the mortar & pestle? It's very common here in Singapore and really cheap too! Sorry to rub it in. Does this mean you are gonna cook this? Kewl! I'm really intrigued by the dish, so yes, there is a high likelihood that we may well make this sometime after Easter. It sounds amazing. 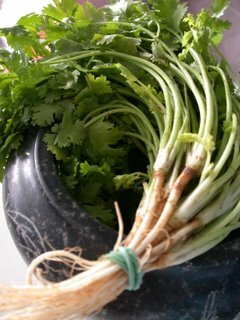 I must say though that we have rarely cooked coriander leaf and generally use it as a garnish. There are mortars and pestles like yours available here but they are molto expensivo. As it happens, we do have two fairly decent sets but not as large, opulent and heavy as yours. P.S. On googling (isn't Google great? ), it appears that "c'est le pied" may be similar to "it rocks"
yes world, I can attest that the chicken cafrael was superb. It seems to be important that the chicken is marinated and then slow cooked as Stpehanie mentions - looking at the ingredients you might suspect that the paste would be overpowering, but not a bit of it - it was REALLY really smooth and not at all sharp - quite wonderful in fact - thanks Stephanie.. Oh, and I did like the peppers with rice, just unfortunate that your cooker didn't scorch the sking and wilt the pepper a bit more though - somehting out of your control! Cheers and thanks for the great dinner! Those stuffed peppers (as well as the exotic-sounding chicken cafrael) looks delish!! Eliza - What a pity you have only used coriander as a garnish! I use it in everything - including a pesto kina like your mint pesto. And thanks for the translation. Tried babelfish and it did not compute! Graeme baby! Glad you liked it - still wish Oscar could have enjoyed it too though. Pille - The stuffed peppers were much better the next day when I reheated them with a splash of balsamic vinegar & a dollopog butter. Yums!